These fun hands on activities are simple to set up and make learning letter sounds fun and exciting for any preschooler. All of the activities either offer free printables or use objects that you already have around your house. Variety is the spice of life, so incorporating several of these activities into your teaching routine, will help to keep your kids interested in engaged. Clink the links below to view each exciting activity. Farm Animal Letter Sound Matching Game, by Toddler Approved – This friendly farm activity focuses on beginning letter sounds. Letter Sounds Race, by Inspiration Laboratories – This multi-purpose activity teaches letter recognition in addition to letter sounds. It also incorporates gross motor to keep your kids active and moving. Letter Slap, by Frugal Fun 4 Boys – This fast paced activity also incorporates sight word instruction. 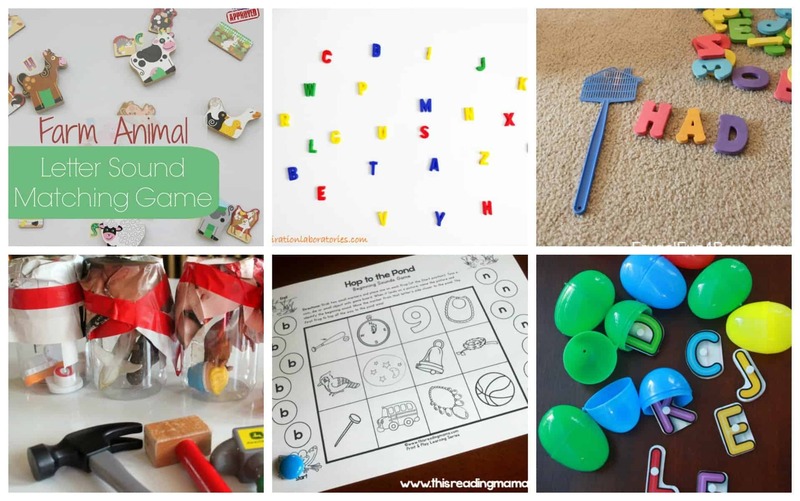 Letter Sounds Punch Game, by Hands On As We Grow – This fun gross motor activity uses items you already have around the house. It doesn’t get cheaper than this! Beginning Sounds Game, by This Reading Mama – This awesome printable game can be played with 1 or 2 players. Shake A Sound Letter Game, by Well Nourished Nest – This cute listening activity will help you put all those stored Easter eggs to good use. DIY Phonics Game, by One Time Through – This fun game helps your child connect letter sounds to real world items. Letter Sounds Listening Game, by Mom Explores The Smokies – This awesome letter sounds game incorporates gross motor and helps to build crucial listening skills. Fishing For Letters Alphabet Game, by The Kindergarten Connection – This is a great sensory activity with free printable. Letter Sounds Alphabet Game, by Mom Inspired Life – This perfect printable game can be played with 1 or 2 players and only requires dice and dot marker. I truly hope that you enjoy each of these wonderful activities. Happy learning! This is perfect for us! We’ve got the letters down pat, now we’re slowly working on introducing the matching sounds! Thanks! I’m glad you’re enjoying the activities! These activities do not come with a printable. Sorry.